This list cancels all previous lists and these prices may be changed without notice. All orders are subject to crop conditions and on condition that orders shall be void should injury befall our stock from hail, fire, frost, error in count or other causes beyond our control. All sales are cash and carry unless credit has been established prior to ordering. Firms that have established credit with us may purchase on the following basis. After 30 days a 1½% service charge will be added to the unpaid balance. This is equivalent to 18% per annum. In the event an account is placed in the hands of an attorney for collection, the purchaser agrees to pay all legal and/or collection costs. New accounts are required to submit an application. Applications are available upon request and require a brief description of your firm, plus the name of your bank and a minimum of three trade references. Please allow two weeks for processing. Please pick up your plants promptly when they are ready unless otherwise arranged in advance. 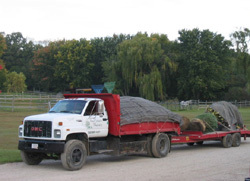 See that your truck is adequately equipped with tarps and ropes to protect your plants from windburn and drying. No claims will be entertained if your material has not been tarped. We express or imply no warranty to the productiveness of life of nursery stock we sell. 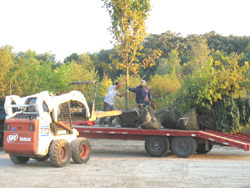 We will not be in any way responsible for the results secured in transplanting due to the fact that there will be many conditions in each plants’ establishment process and environment which we have no control over, such as, but not limited to: proper handling, soil preparation, planting, watering, mulching, insect damage and weather. Our total liability for any errors shall be limited to replacing free of charge or refunding the original purchase price at our option. It is mutually agreed that the original purchase price shall be the maximum damages purchaser is entitled to claim. Unless you have filed a Wisconsin resale certificate with us, we are required to charge a 5% Wisconsin State Sales Tax and a 0.5% Kenosha County Sales Tax. Claims for any cause must be made promptly on receipt of stock. We will not entertain claims when a claim is not made in writing within 5 days after receipt of stock.